The spectacular countryside of Evrytania enchants all visitors. 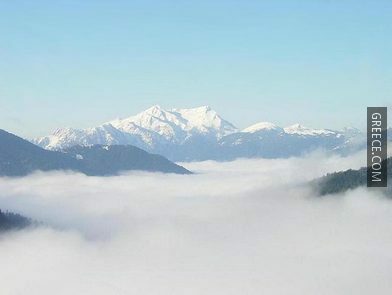 The region has a unique alpine environment and rich cultural and historic heritage, constituting one of the cleanest ecosystems worldwide, according to UNESCO in 1991. The healthy climate, the forested slopes, and the countless streams give the impression of heaven on Earth. 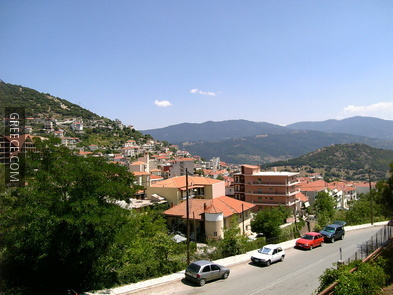 The region is the most thickly wooded, best-watered area in Greece. 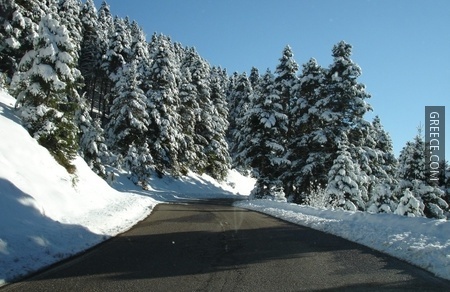 There are so many fir trees in Evrytania that you think you are amidst a magnificent forest. This is why the region has been nicknamed “Switzerland of Greece”. 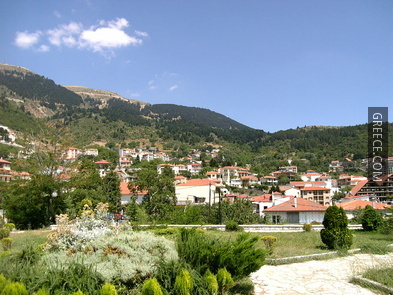 Karpenisi is the district capital of the prefecture and it is built on the foothills of Mt. 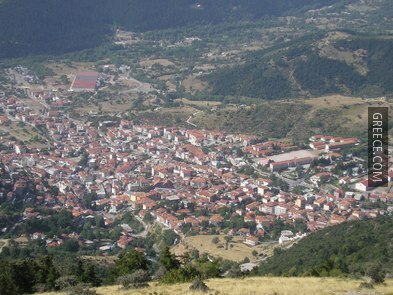 Timfristos, at an altitude of 960 metres. The capital is situated in a valley of the Karpenisiotis River, a tributary of the Acheloos and the Megdova Rivers. Among the town’s characteristic features are the workshops that produce handmade brass bells for animals. One of the most striking things, immediately thrilling all visitors is the traditional architecture of Karpenisi, featuring wonderful samples of local masonry with well preserved settlements, restored manor houses, Byzantine churches, school buildings now housing museums and splendid arched bridges. 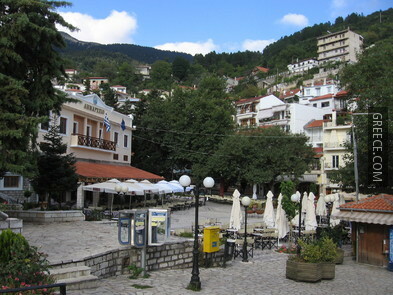 Its picturesque location, the continually developing tourist infrastructure, the large number of museums, churches and monasteries, the local cuisine, and its nightlife in combination with numerous traditional villages and a popular ski resort make the city a popular starting point for year-round travellers and nature lovers that want to visit the broader region. There are two possible explanations for the origin of the name “Evrytania”. It may derive from the Greek word “ev” which means “well” and the verb “hreo” which means “flow”; so, “Evrytania” means the place where there is plenty of fresh water. The second explanation is that the name comes from the verb “evrio” which means “stretching the cord of the bow”, hence the name of the first king of the area, Evritos, who was an excellent archer. According to Homer, the first known inhabitants of northern Evrytania were the Dolopes, who took part in the campaign against Troy around 1100 BC. The ancient capital of the region was Oihalia, situated close to the modern city of Karpenisi. It is also known that the honourable goddess of the area was Diana, goddess of hunting. In the later Roman Era, the area of Evrytania became known because of the famous battle that took place in the location “Kokalia” between the Roman and the Aetolian Commonwealth (Greek) armies, ending in favour of the former. During Byzantine times, the people of the region had the privilege of self-government and tax exception. Because of that the northern part of the district was named “Agrafa” (unwritten), because the residents were not listed in the Imperial tax registers. 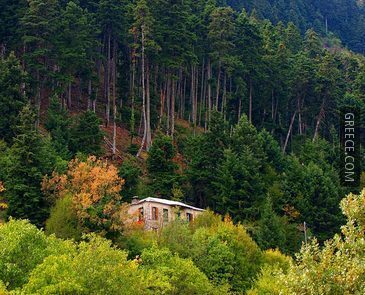 During the Turkish occupation of Greece, this area remained free, especially the remote areas in the mountains. 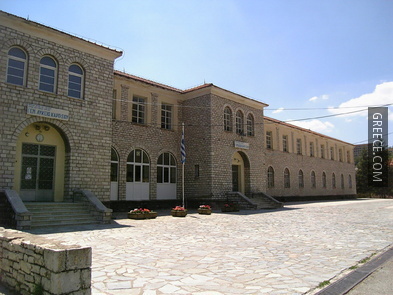 During the 18th century a famous school was created here by Evgenios Giannoulis, the Aetolian school which contributed in awakening the national spirit of the Greek nation. 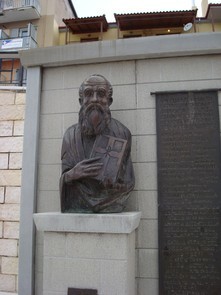 In the area, at the now historic site of Kefalovrisso, one of the leaders of the Greek Revolution of 1821, Markos Botsaris, was killed by the Turkish army. However, the Greek troops won the battle after a brave fight. During World War II, when Hitler’s Nazis and Mussolini’s fascists occupied the whole country, a “Government” was established in the village of Viniani during the spring of 1944 and proclaimed elections for a National Council. The area became the stronghold of Greek freedom fighters (Hellenic Liberation Army – EL.A.S.) against the German occupation. 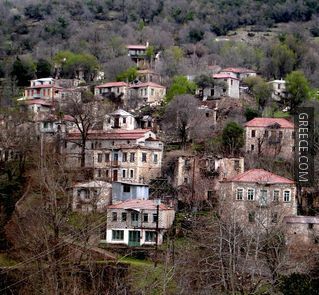 Korishades: This small traditional village is situated just 5km southwest of Karpenisi. Except for the amazing view on your way to the village, the settlement has unique beauties and historic monuments. Well-preserved stone mansions, remains of ancient graves at the “Paliokastro” hill and the interesting museum of the National Resistance are some of the things you must see while here. Rooms to let and traditional hostels offering a comfortable stay can also be found here. 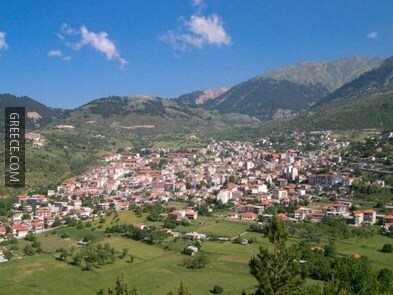 Mikro Horio: This village along with Megalo Horio are two of the most developed tourist areas of Evrytania. 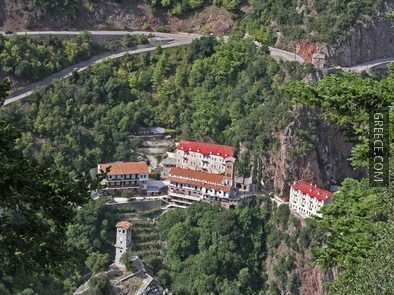 Mikro Horio is built at an altitude of 900m, 13km from Karpenisi and it is surrounded by the mountainous complex of Velouhi, Kaliakouda, and Helidona. The settlement is situated just 2km away from Palio Mikro Horio (Old Village) which literally disappeared after a landslide on 13 January 1963. A small lake was created at the village entrance. At the old school of the village is the Museum of Palio Mikro Horio, which offers rare photographic material from its historic route. 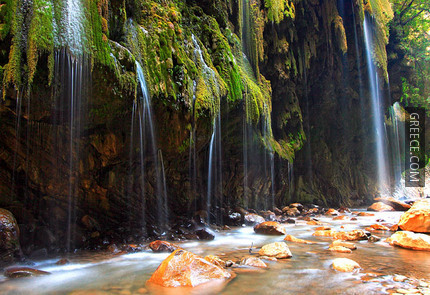 Megalo Horio: This amazing village lies near Mikro Horio. 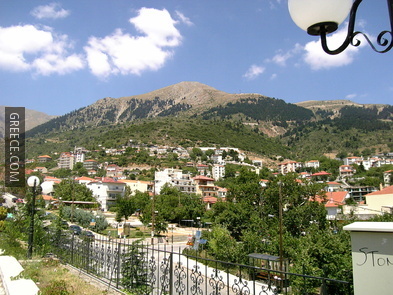 It is situated in an equally lovely setting on the slopes of Kaliakouda, opposite Mt. Helidona. The settlement has an amazing small stone paved square located in a unique site with an excellent view of Klidi, a lush majestic gorge. Krikelo: East of the capital town of Karpenisi, at an altitude of 1,120m, the road leads to Krikelo, another small, beautiful and verdant village. Its charming square with little cafes is its main attraction. 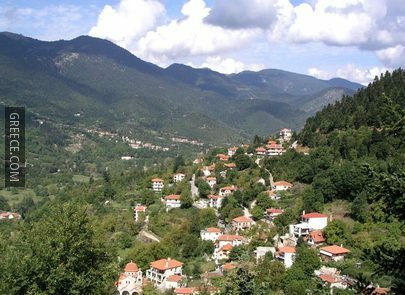 Domnitsa: Close to Krikelo, east of Karpenisi is Kokalia, a historic location among fir trees just before the lovely village of Domnitsa. Despite the fact that the road to this settlement is no longer paved, it is well worth making the effort to get to Domnita. 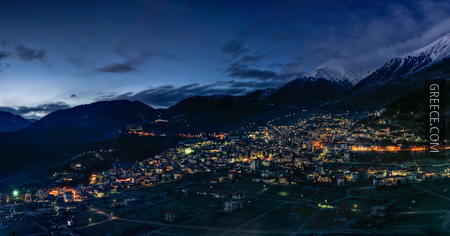 This mountainous village is situated at an altitude of 1000m, 41km from Karpenisi. The settlement is full of small churches with superb wooden icon screens and icons. The whole region of Domnitsa is full of wildlife, hare, partridge, woodcock and wild boars. 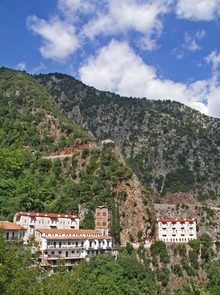 Moreover, the fir forests of the area and Krikellopotamos, one of the biggest rivers in the prefecture, are worth seeing. Proussos: The village of Proussos, 800m above sea level, is not only beautiful; it also has an interesting cave, the Black Cave. Believed to have been the site of an oracle, the cave has two entrances, one in the village, and the other further away. Anatoliki & Ditiki Frangista (Eastern & Western Frangista): West of Karpenisi is situated Anatoliki Frangista with Ditiki Frangista just 4km further on. Both settlements are located in an especially lush area with a wonderful climate. The church of the Saviour (Sotir) in Ditiki Frangista is worth a visit. It was built in 1725 and its walls are covered in Byzantine frescoes. Agios Nikolaos: This beautiful village is situated 9km from Karpenissi. The settlement is famous for its chestnuts and its delicious beans. At the square there is the old church of Agios Nikolaos, built in 1887. In the surrounding area there is also the country church of Agia Parskevi, as well as the spots Platanias, Krania, and Palialona. Karpenisi bus station is just beyond the central square. There are several buses daily to Athens (5 hours), and Lamia (2 hours). Also, there are daily services to/from Agrinio in Etoloakarnania (3 ½ hours). 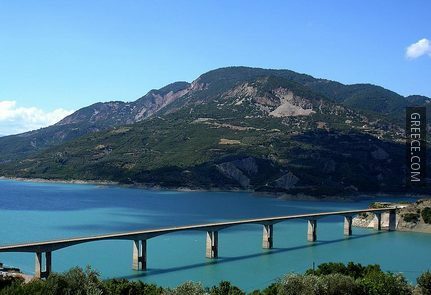 Evrytania has a Mediterranean climate with frequent rains, mild winters and cool summers and is surrounded by great aquatic richness, and grand high-fir and chestnut-tree forests. 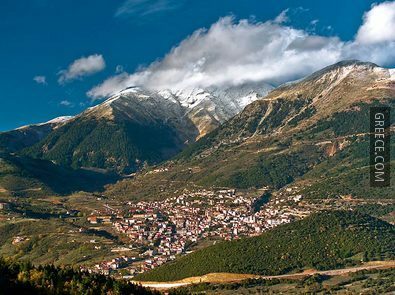 Because of its mountainous terrain, most of Evrytania villages are covered in snow many months in the year.